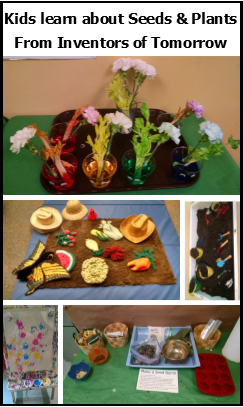 As part of our Biology and Life Sciences theme, we studied seeds, plants, and flowers. Question of the Week: What 4 things does a plant need in order to grow? Terrarium: Our Engineering project of the week was to build a small environment/terrarium for growing plants. We used clear plastic bottles such as 2 liter soda bottles or large juice jugs. We cut them in half. You turn the top half upside down and nest it in the bottom half as shown below. Then put in layers of rocks, horticultural charcoal (to prevent mold), soil, then small plants. We gave instructions about taking it home and putting it in a sunny spot and then watering it every few days so we could talk to kids about the fact that plants need soil, air, water, and sun to grow. In class: Have the child take a small handful of pulp – push some seeds deep inside it. (Note: medium sized seeds work best. Itty bitty seeds like chamomile are hard to see and easy to drop. Big seeds like squash and pumpkin are hard to fit inside the bombs.) Squeeze out most of the extra water, making a ball. (If you squeeze out too little, it’s too wet and will fall apart – if you squeeze out too much, it’s too dry and will fall apart – just add a little water back in…) Optional: press it into a mold to make the desired shape. Then put in a plastic baggie to take home. At home, you can plant right away, or take it out of the plastic baggie to dry, and then use it later. Can plant in your yard, or a planter, or chuck it over a fence into a vacant lot to add some pretty flowers to the weeds growing there. (Note, if you don’t like the connotation of “bombs”, you could just call these paper seed pods.) Learn more about a similar project at Twig & Toadstool. Bean Seeds: The night before class, we wrapped our dry lima beans in a wet paper towel to soften up the surface before planting. 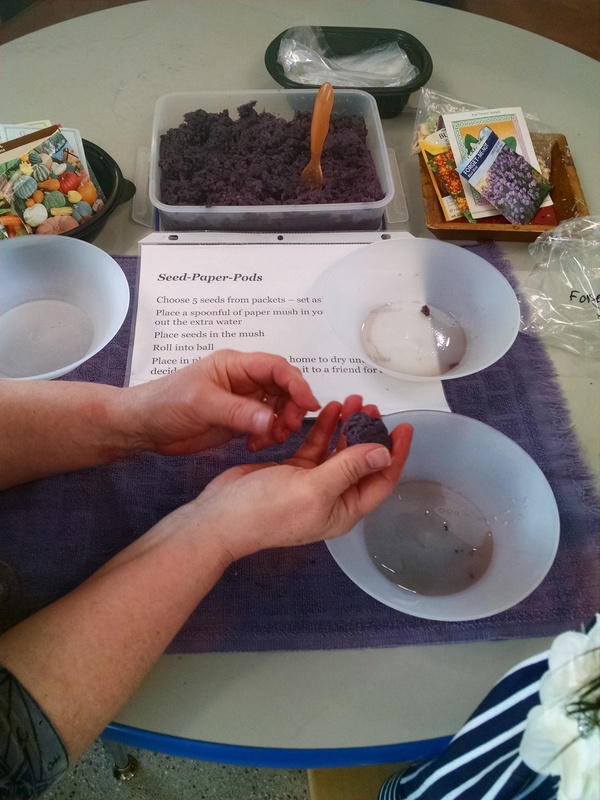 Germinate a Bean: Children folded a paper towel, sprayed it till it was wet, put it inside a ziplock, and added one bean seed. 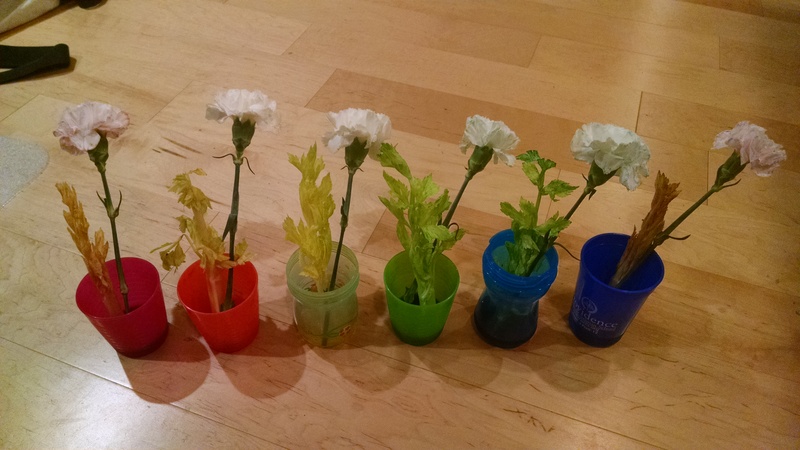 Take Home Instructions: We told them that plants need soil, air, sun and water to grow. We told them that they should take their bean seeds home, and tape the baggie up in a window and put the cup on the window sill so they both get plenty of sun. Every few days they should water the seed in the cup, and if the paper towel has dried out, they should add water to the bag. We showed kids a picture of how beans seed develop, pointing out that they develop under the ground, and at first it’s hard to see them growing. 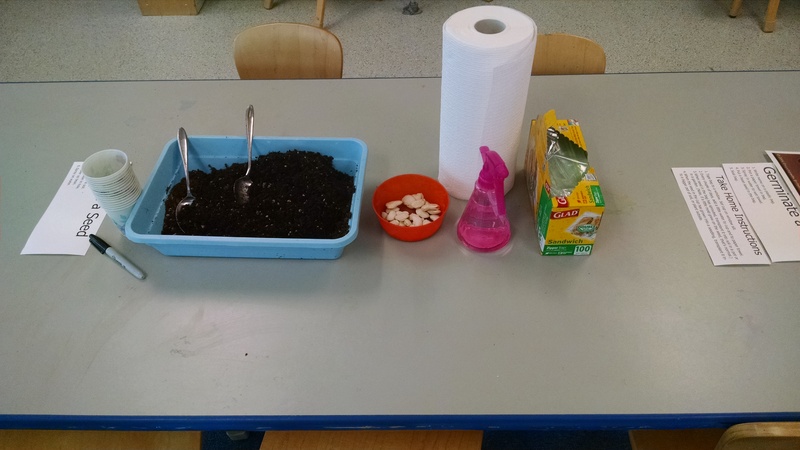 We said they would be able to see the seed in the plastic bag sprout and start to grow, and they will know that the other seed is growing under the soil. We let them know that once the bean seed in the cup pokes up a seedling above the ground, the seed in the bag will likely have roots. They will need to transfer the seed from the plastic bag to dirt. It can start to grow in the bag with just water and sun. But to get bigger it needs soil and fresh air. 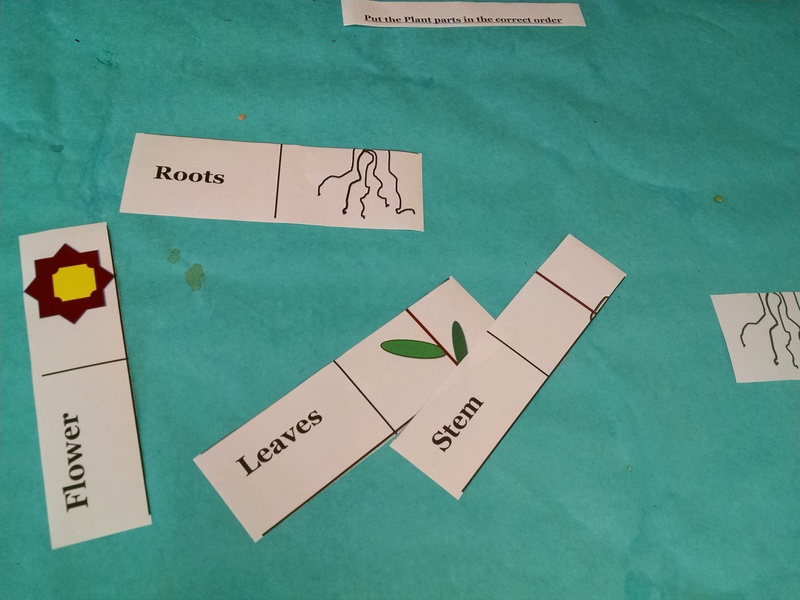 Sequencing – How does a Plant Grow: We printed the sequencing cards from http://homeschoolcreations.com/files/Garden_Preschool_Pack_Part_1.pdf so the kids could put in order the steps from a bean beginning to sprout and getting bigger and growing roots. We also printed a few examples from online of diagrams that show how a plant grows from seed to mature plant. Observation: Display of Plant Growth. 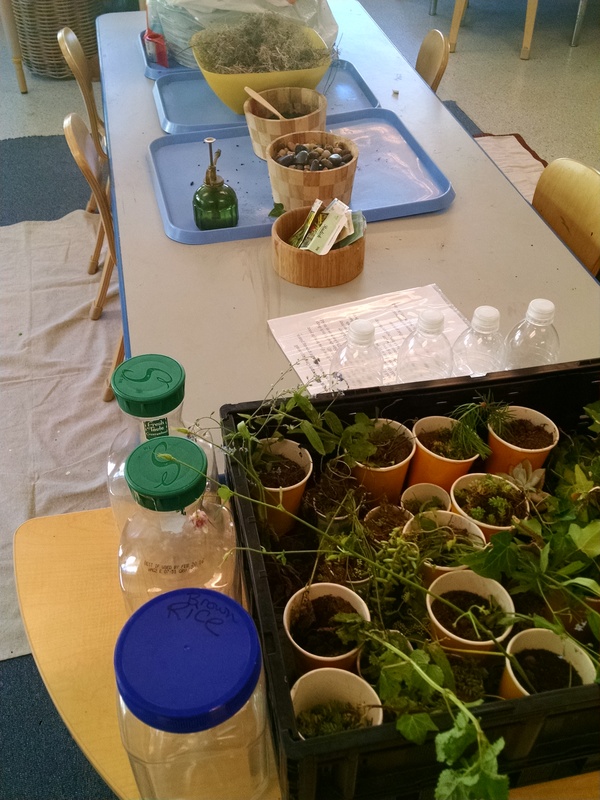 Last year, we planted a variety of seeds in an egg carton five days before class so kids could see the sprouts. They just barely sprouted – none were big enough to be able to see what type of plant they were. The sprouts were on a table to look at with magnifying glasses, plus during circle time, they were used to illustrate places in the book where it talked about plant sprouts starting to emerge from the ground. We did have a demo of growing plants. 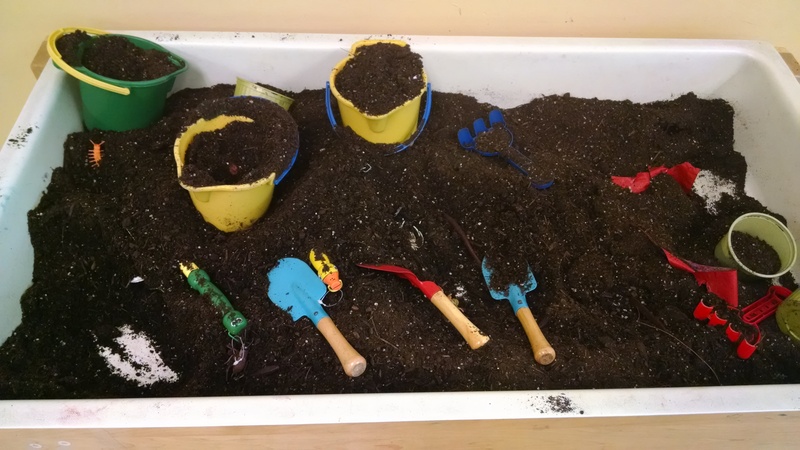 We share our classroom with another program, Creative Development Lab, which one month ago had a project where they had a bin full of soil, grass seeds, and “rakes” so kids could plant the seed. It’s been growing for the past month, so we put that out for kids to see. I also made a poster to show the progress over time. 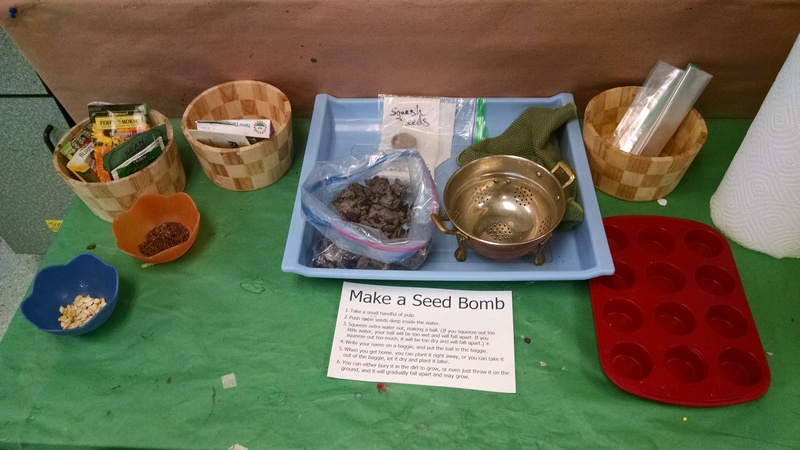 Read more about these types of experiments at TinkerLab, Outlaw Mom, and PBS. 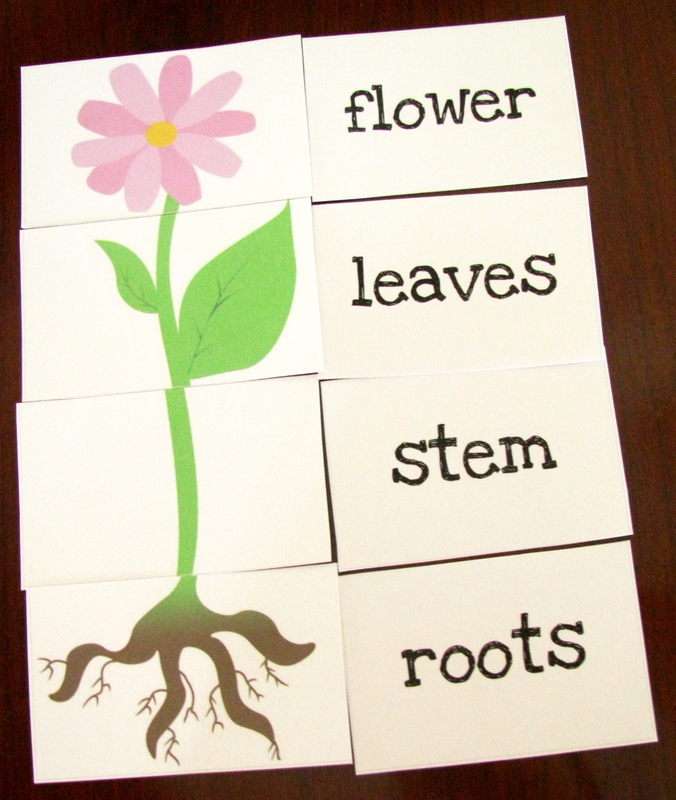 Plant Parts Puzzle: Make a puzzle with a picture of a flower with leaves, stem, and roots – cut into four puzzle pieces for kids to assemble. There’s one at L is for Learning. Here’s the PDF we designed last year, and a photo of it (on the left) – this one is better for preschool age kids. And, here’s the free printable PDF for this year’s version, and a photo of it. (on the right) This one is better for kids kindergarten through second grade or so. Celery Rose Prints: Cut the base off a stalk of celery. 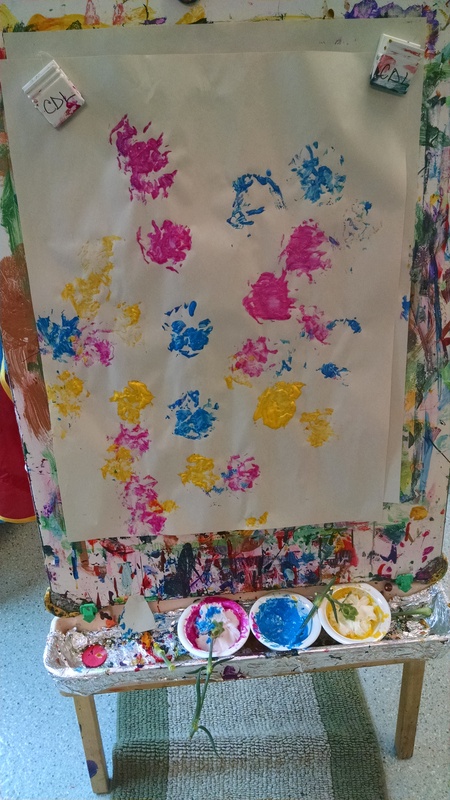 Use it and paint to make prints. You can also use cut bell peppers and other fruits and veggies for interesting prints. Water bottle flower prints. 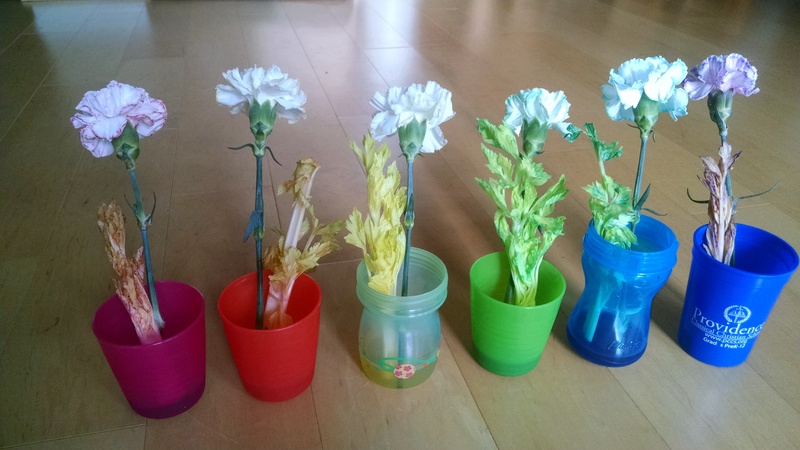 In my son’s kindergarten, they did a project where they used plastic water bottles, soda bottles, and juice bottles (use a variety of brands) to make flower prints. Just paint a thin layer of paint on the bottom of the bottle, and print. The yellow one was a 16 ounce Pepsi bottle. Red was Dasani water. Orange and pink were Kirkland water bottles. Later, after the paint has dried, you could add paint or paper stems or leaves. 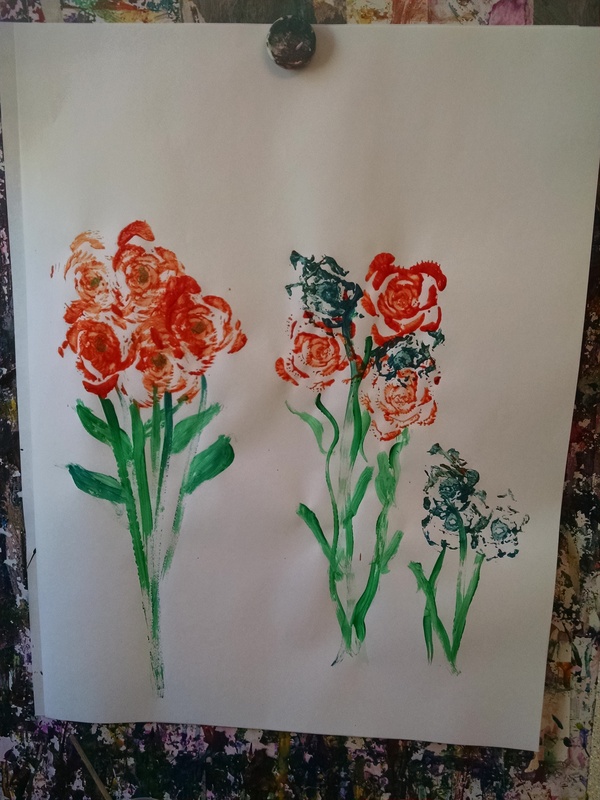 Paint with Flowers: at the easel, instead of brushes, children used carnation flowers and stems to paint with. 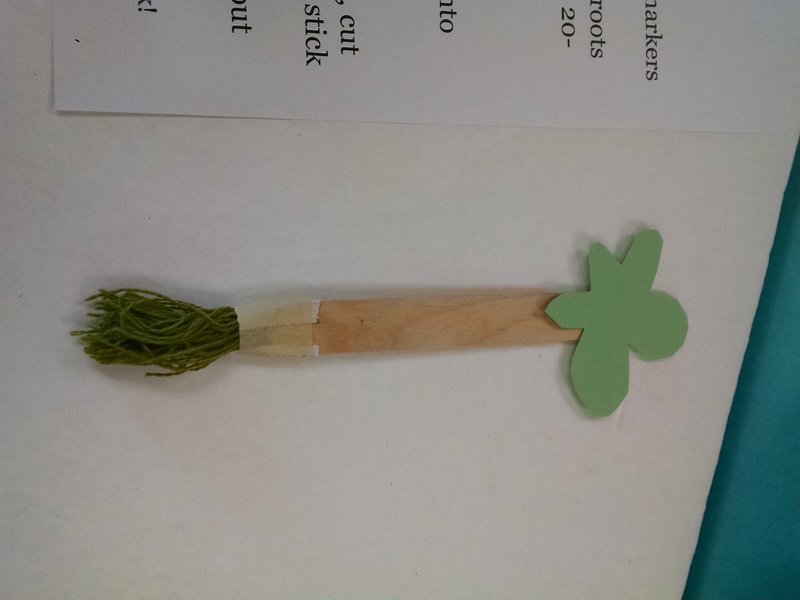 Flower Bookmark: Take a popsicle stick. Color it. Tape yarn fringe on one end to be roots and tape paper flower on the other end. 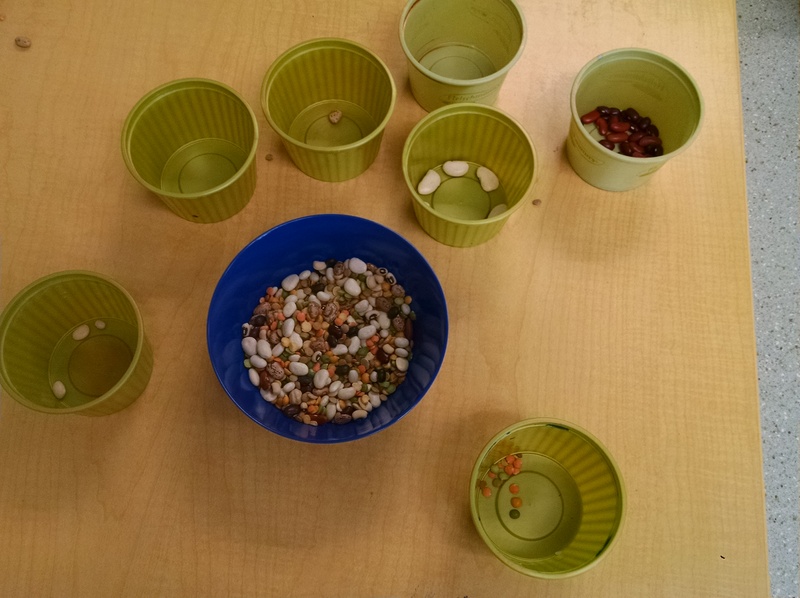 Math / Science Skills: Bean Sort: Put a bowl of beans and/or seeds out with several empty containers. Kids sort beans/seeds by type, then can count how many of each, compare which they have the most of / least of and so on. They can also learn vocabulary by learning the names of each bean. I got a 15 bean soup mix, and really a 6 or 7 bean combination might be more appropriate at this age. 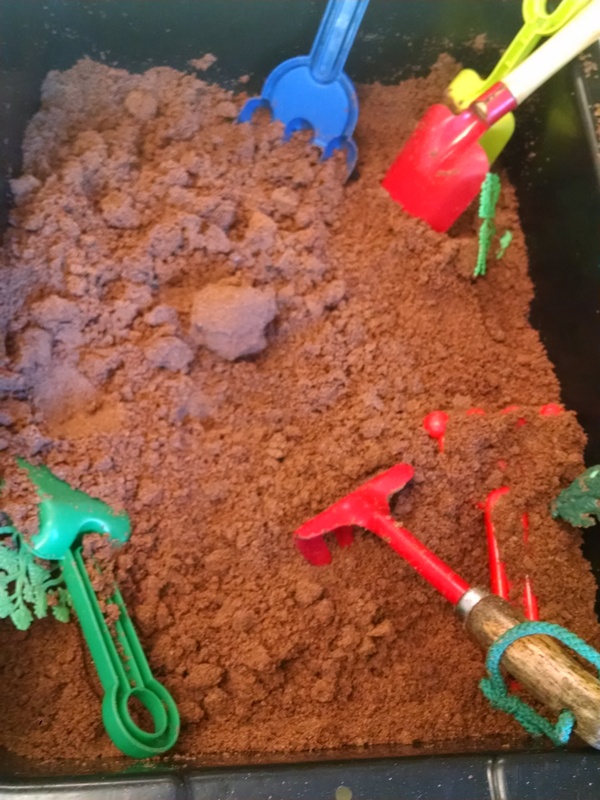 Sensory Table: Fill it with something that looks like dirt: One year, we used cloud dough (flour, oil and cocoa powder). Sometimes we use potting soil. This year, we used Coconut Coir Fiber. I got it in the gardening section of our Ace Hardware. It comes packed in a dense brick – you soak it in water and it expands to several times its original size. Then you break it up, and it looks like dirt. It’s cheap and easy to use and compostable when you’re done. Add gardening tools (trowels, rakes) and plastic plants and/or bugs. Could also add lima beans or another big seed that would be easy to sift out of it later. Water Table: Watering cans to pour with plus spray bottles. We also threw in some clear glass stones, which look like odd bubbles in the water till you touch them and discover they’re solid. We also put in silk flowers. 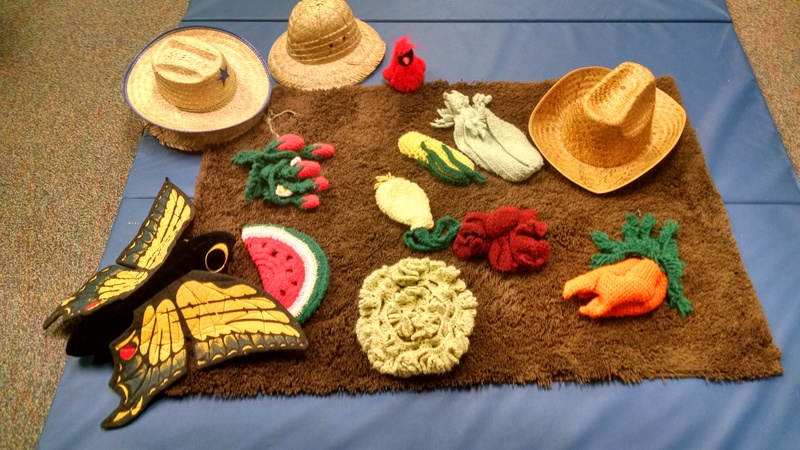 Imaginary Play: We had big mats covered in brown fabric to be a gardening plot. (Or, this year we had a brown rug.) 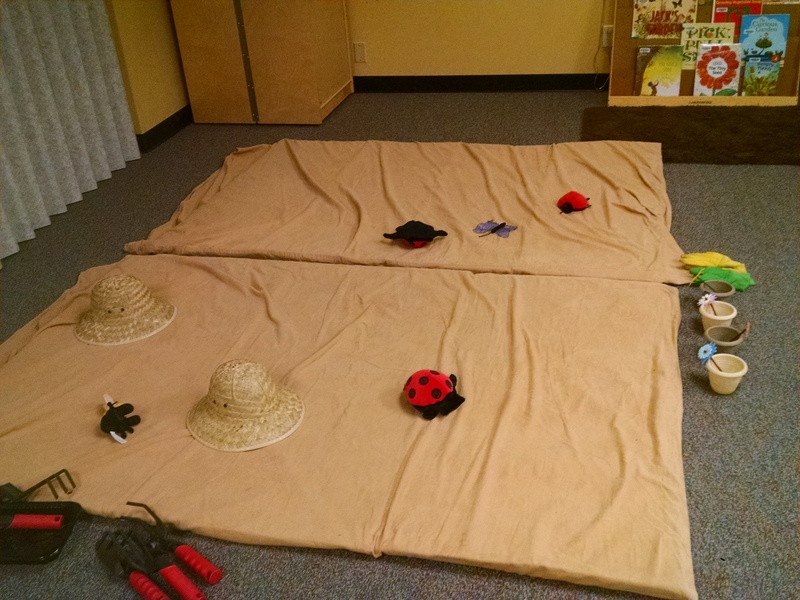 We put out gardening gloves, hats, gardening tools, plant pots, fake flowers, and bug puppets. 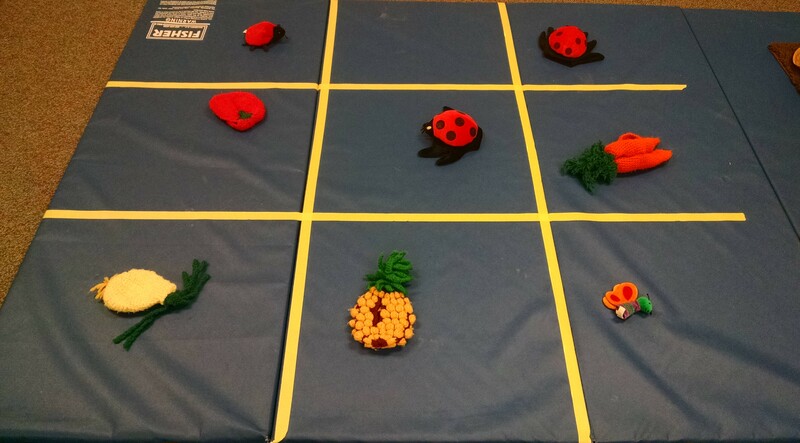 We also marked out a tic tac toe board on the mats, and had crocheted fruits and veggies plus the bug puppets so they could play plants vs. bugs tic tac toe. 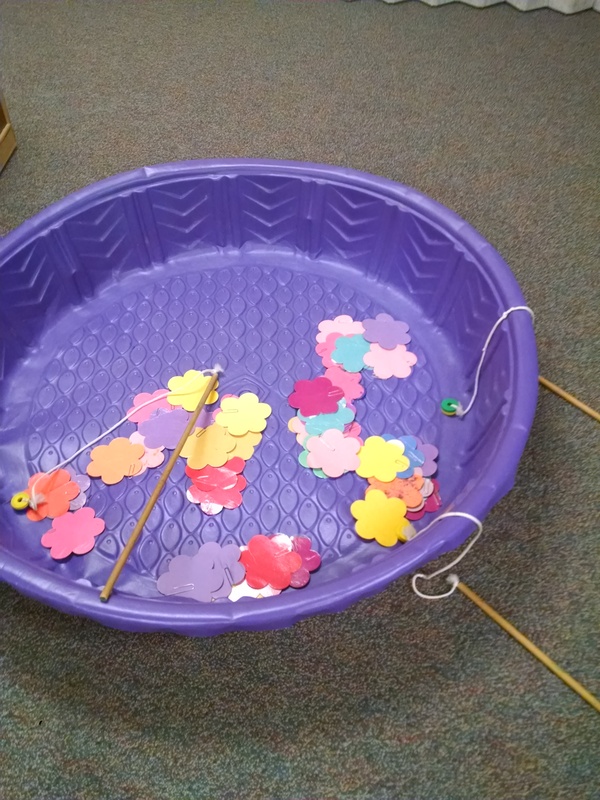 Motor Play: The other class we share our space with happened to have a fishing pond activity where kids could use fishing poles (dowels with magnets tied on) to fish for paper flowers with paper clips attached. 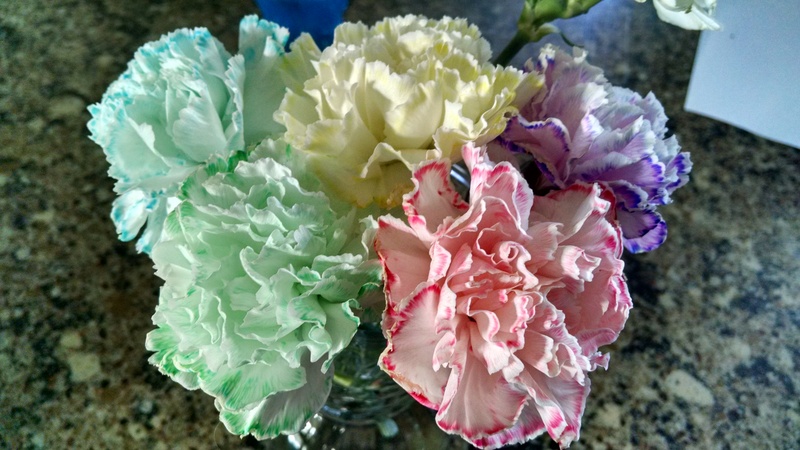 You could make tissue paper flowers with pipe cleaner stems. Just search Pinterest for a hundred examples. 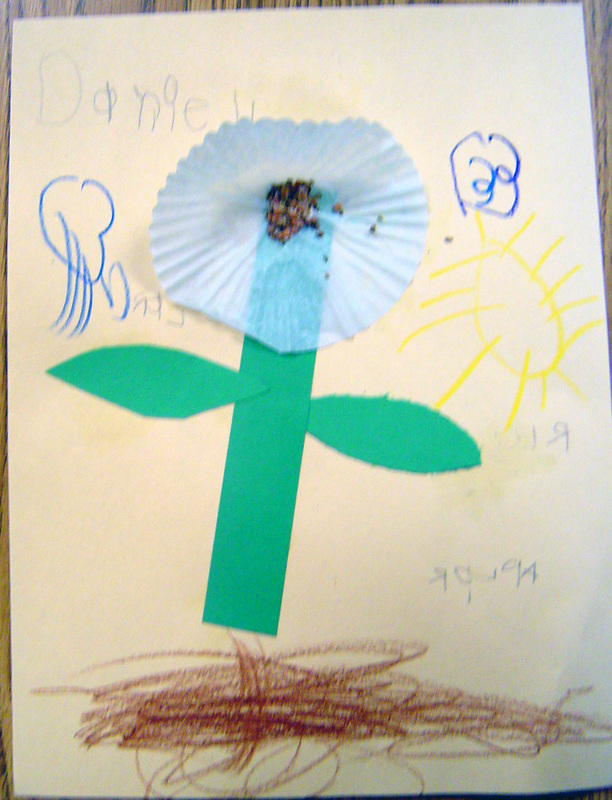 Make a collage with seeds. Make a musical shaker by filling a small container with beans or seeds. Dissect a flower. Learn more at Gift of Curiosity or Montessori in Bloom. Dissect fruits. You could work together to dissect a variety of fruits so they can see the range of seeds – cut open an avocado, peach, or cherry to show the one big pit. Cut open an apple or citrus fruit to see a few seeds distributed in a fruit. Cut open bell peppers or pomegranates for LOTS of seeds, and display how a strawberry keeps its seeds on the outside. This is a fun snack-time activity. You could also practice prediction (a key science skill): First guess how many seeds will be inside, then cut it open and count seeds. 4-3 rhythm. Have them say watermelon. Clap the syllables. Count the syllables as you clap. Then do the same with dandelion. Then huckleberry. Then do black-eyed pea… huh… that’s only three syllables. Then try pumpkin seed. Then blackberry. Then do a 4-3 pattern, saying/clapping watermelon, black eyed pea. Then clap a 4-3 pattern without saying those words out loud. 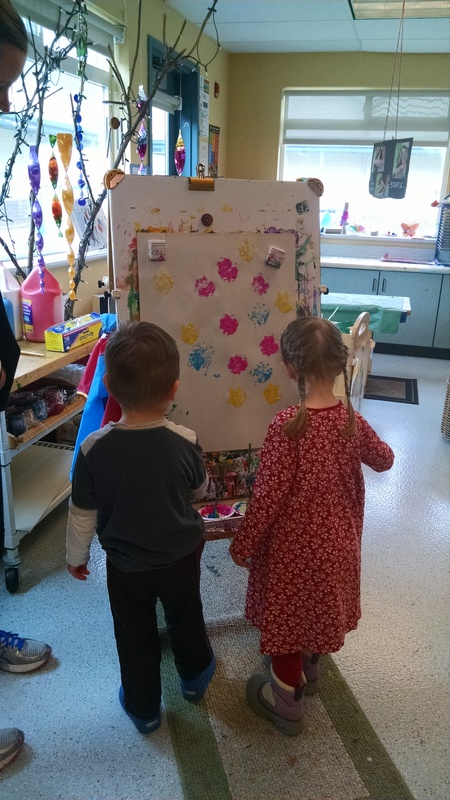 The Big Idea: We drew a picture of a flower growing (with roots) on the board. We asked kids what plants need to grow, and wrote the answers on the board as they came up with them: Sun, Water / Rain, Dirt / Soil, and Air. We talked about what animals and humans need (a review of idea from our Habitats and Adaptations classes) and how that’s similar and different. Book: Last year, we read Two Old Potatoes and Me by Coy. A boy finds two old potatoes with sprouting eyes at his dad’s house. He is about to throw them away, but his dad suggests they plant them. They cut them into pieces, plant them, water them, and wait… eventually ending up with over 60 potatoes. Great story about growing process and patience. This year, our library no longer had the book, so we chose other options (see below). All it takes is a rake and hoe and piece of fertile ground. Book: We read If You Hold a Seed by MacKay. This is a beautiful quiet story where a boy makes a wish, plants a seed, and then we see the seasons and years pass by until the tree and the boy are fully grown. And then the man takes his son to the tree and they plant a new seed. Just a gentle way to examine life’s seasons. One Bean by Rockwell. This would be a FABULOUS book to accompany a class project where you plant lima beans and take them home because it’s the story of a boy doing just that, and each of the steps in its development, from planting the seed to harvesting the beans. I might not read it if I wasn’t planting beans because kids might be disappointed they didn’t get to try it. Ages 3 – 6. The Carrot Seed by Krauss and Johnson. This 60 year old classic tells a story of a boy who plants a seed and has high hopes (that others don’t share) that it will grow to something wonderful. 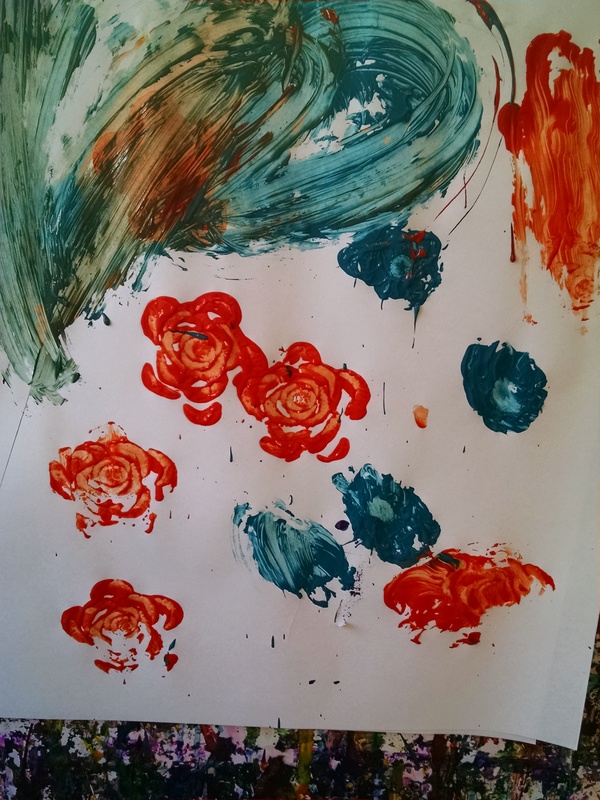 Jack’s Garden by Cole. This is a cumulative story. The first page says “This is the garden that Jack planted.” Then on each page, it adds a new sentence and repeats what has come before, so by the end it’s “These are the birds that chased the insects that sipped nectar fro the flowers that blossomed from the buds that formed on the plants that grew from the seedlings that sprouted with the rain that wet the seeds that fell on the soil that made up the garden that Jack planted.” Full of detailed naturalistic drawings of birds, eggs, insects, plants, and gardening tools. If you prefer a more serious, less silly book, this is a nice one. A Fruit Is a Suitcase for Seeds by Richards. Nicely illustrated book for kids age 4 – 7, which talks about a really nice metaphor: “many seeds travel inside fruits. The fruit is like a suitcase for seeds. It protects them on their trip. Fruits look beautiful and taste good, so animals and people eat them and drop the seeds in different places.” It illustrates fruits with pits, some small seeds, many tiny seeds inside, and seeds on the outside. This would be a great companion to the fruit dissection project. From Seed to Plant by Gibbons. I can’t count how many Gail Gibbons books we’ve checked out for class this year! And they’re always good non-fiction books – nice illustrations, good writing, clear explanations of scientific ideas. I can’t say I ever fall in loved with one, and we don’t read them aloud at circle, but absolutely worth having on the bookshelf for kids who want to learn more! Best for 5 – 7 year olds. The Curious Garden by Brown. A nice story of urban transformation… what if in a dreary city with no greenery of any kind, a curious boy went walking on an abandoned elevated railroad track and found wildflowers and plants? What if he tended a garden there? What if new gardeners popped up all over town? Nice read-aloud for 4 – 7, but may be a little wordy for 3 – 4 year olds. What’s in the Garden? by Berkes and Arbo. A page offers a rhyming riddle: “The part that you eat is way in the ground, so how can this fabulous food be found? Look for the feathery leaves on its top. It’s long and it’s orange – a real healthy crop.” The illustration shows the plant and an insect or bird. Kids guess what the plant is, and on the next page, there’s a recipe for something using that plant: blueberry pie, tomato sauce, French onion soup… At the back of the book, there’s adult-level info on each of the fruits and veggies, a discussion of what plants need to grow, plant anatomy, a glossary of cooking terms, and useful websites. Best for kids age 6 – 8. Best if used in conjunction with a gardening project or a trip to a farm. A Seed Is Sleepy by Aston and Long – the author and illustrator of The Egg is Quiet we had for our Eggs theme. A book that can be read aloud at different depths… you could just read the big words on each page (A seed is secretive). Or you can add the note that ties to that (It does not reveal itself too quickly). Or, there’s the full details (Most seeds sleep through a season of two, waiting for the warmer temperatures of spring. But some take their time. Ten years might pass before the bright red-orange seed of the Texas mountain laurel shows its purple blooms.) Each page has very detailed, beautiful, naturalistic paintings. 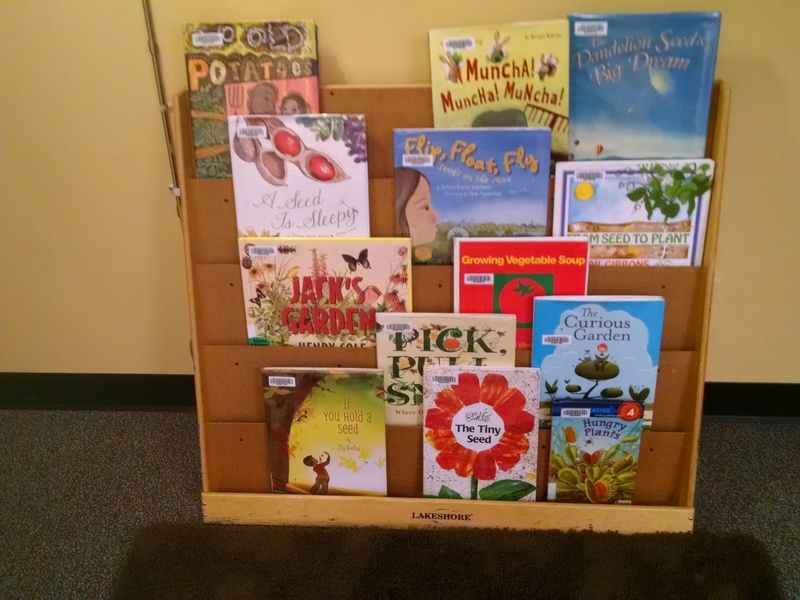 I honestly don’t read these aloud – I put them out at an observation station… next to eggs and magnifying glasses, or next to some growing plants to encourage the child to look deeply at both the book and the items. Growing Vegetable Soup by Ehlert. If you want a good basic book for 3 – 4 year olds about the process of growing a seed, and what it needs to grow, this is great. Too simple for older kids. The Tiny Seed by Carle. About seeds being blown across the world. The tiny seed is lucky not to land on the icy mountain, or in the ocean, or the desert or get eaten by a bird or a mouse or get picked before it produces seeds of its own. Nice story, but this is one where I wonder how one seed traveled so very far through so many climates… kids won’t wonder that, but I do. Pick, Pull, Snap! : Where Once a Flower Bloomed by Schaefer and George. I love the illustrations. Love the fold out flaps. The words are not as engaging for young children as I wish they were. “In the field, wind waves golden tassels high above heads, and pollen floats through the air to the silks of a flower.” It’s good to have on the shelf, but I don’t read aloud at circle. Flip, Float, Fly! : Seeds on the Move by Macken and Paparone. Nice illustrations and nice text talking about all the ways seeds move through the world: maple seeds fly like shiny green helicopters, tumbleweeds scatter their seeds as they roll, roll, roll; locust tree pods skitter and skate on slippery ice. If we had more time in circle or discussed seeds in more detail, this would be a great read-aloud. How a Seed Grows by Jordan and Krupinski. Ages 5 – 7. Offers a basic introduction to seeds and how they grow, then the majority of the book is a detailed description of project where you plant bean seeds in eggshells, care for them over the weeks, then transfer them to the garden and care for them till they yield beans. If you want to do the project described in this book, it’s a great book! If you don’t want to do it, I wouldn’t get the book – I find that if I get a project-based book and then don’t do the project, it just makes my kid cranky at me. Another good book is Planting a Rainbow by Ehlert. We read it during Rainbow week. If you can find Watermelon Magic, it’s great! There’s lots of great videos on YouTube of timelapse photography of plants growing. But if you watch them, you’ll need to explain timelapse to your child and explain plants don’t really grow that fast. I’m sure there are plenty more great stories of characters planting seeds and having a hard time being patient waiting for them to grow, then enjoying the harvest. If you have a favorite, let me know in the comments!